I have been a forex trader since more years. From time to time I still trade, but my trading times have increasingly dropped since I feel its more and more boring waiting for the market to give you a proper signal all day. The main reason why I am writing this article is because I do not like to sit behind my desk all day. So I have decided to give it to all of you who want to benefit from it. 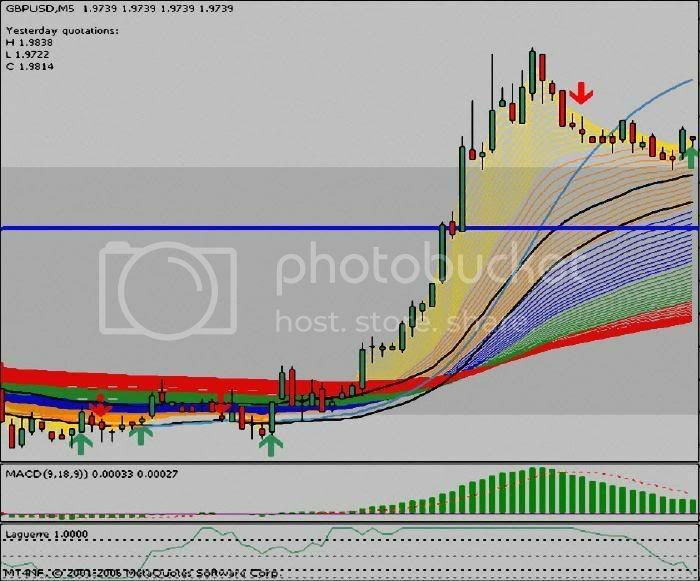 Price for my system was three hundred dollars, but due the relativity of success in the forex market I now have decided to give away my system information for free. May the knowledge bring you success and wealth and if you get both in abundance, remember to share it with those around you. Winning the forex market depends 70% on the trader, the other 30% is the system, so I think it was not fair selling my system even if it has a high probability rate. If you win or lose depends a lot on your personality and feelings so one might lose even if he has the best system in the world. The system was designed during careful analysis of the market in the time of more than six months. It does not need any improving, nor changing. It is fully optimized for trading, so do not attempt to change any indicators or settings! Trade it as it is, demo trade it for at least two months to get a proper feeling of all the indicators and the system altogether. Last but not least, I am not responsible for any financial loss or benefit this information will bring you. You as a trader cary full responsibility for what happens with your money! This is not a “get rich quick” scheme. Real efforts are required to learn trading this system. As always try to demo or paper trade the system first before using real money. Trading the forex market has large potential rewards and as such also large potential risks. You must be aware of the risks and willing to accept them in order to place responsible, informed trading orders. It is strongly advised not to trade with money you can not afford to lose. Notice: This publication is designed to provide valuable information. It is written with the understanding that the publisher or author is not engaged in rendering legal, accounting, or other professional service. If legal advice or other assistance is required, the service of a competent professional should be sought. No part of this publication may be reproduced, stored in a retrieval system or transmitted in any form or by any means, electronic, mechanical, photocopying, recording or otherwise without the prior written permission of the author. The system was created from a need not only to trade profitably but also to give the traders a more clear picture of what they are doing and why they are doing it. Many commercial or public system just consist out of indicators without giving a clear understanding of price movement and inform the trader with signals without him knowing why he got the signal and why he should enter the trade. This way a trader will not thrust the method and as a result he will have a hard time being consistent. If you don’t know exactly what you are doing, you can not thrust the system and if you can’t thrust the system to follow the exact rules, you will not be profitable. 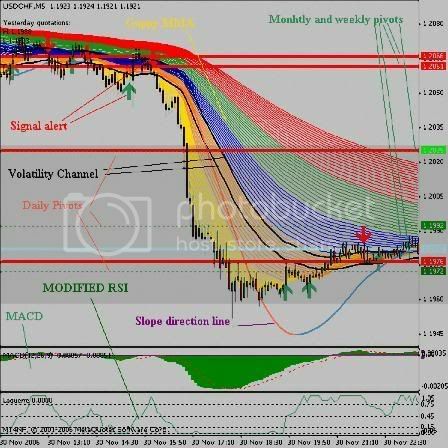 Trend Follower ensures that the entries and exits are clearly defined and at the same time allow the trader to be able to explain why he took the trade! First we are going to take the system apart and provide a little description of all the indicators. The alert is produced by a cross of two Exponential Moving Averages. Faster EMA is 4 and slower EMA is 8. * Signal line – 9 day moving average of the difference between fast and slow. * All moving averages are exponential. The signals from the MACD indicator tend to lag price movements. The MACD Histogram attempts to address this problem by plotting the distance between MACD and its signal line. Because of this, the histogram signals trend changes well in advance of the normal MACD signal. It however should not be used alone, therefore we have other indicators to confirm our signal. This is a technique that measures volatility. It consists of 34 EMA high and 34 EMA low. It is not really a part of the system, but I like to see it, especially if I look for confirmation on longer time frame. This is an advanced form of RSI indicator. The Laguerre Transform provides a time warp such that the low-frequency components are delayed much more than the high-frequency components. Globally, latest bar data has more weight than previous bar data a bit like an exponential moving average. The name says is it all. Its a line that measures the slope of the trend and direction as well. The direction is shown as red for a downtrend and blue for an uptrend. Traders use pivot points to find intraday support/resistance levels. Pivot points are found by a simple calculation which involves the open, high, low and close for the previous day of any particular stock or index. It is said that when a price hovers below a pivot or pivot support/resistance and breaks up through it then its a buy signal (or vice versa for a sell signal). Or if the prices are above the pivot it is considered bullish and if they are below then bearish. The most common way to use pivot points are as reference points for entering trades if your other favorite indicators are also giving the same directional signal. Market Makers can use the pivot points to create a market by shifting the price around between levels to entice buyers or sellers of a stock into a trade. This can best be seen on low volume trading days as the prices fluctuate between the calculated points. In our system we mainly use pivots for exits. You don’t need to know these calculations as they are automatically calculated in the software, its more just for informational purposes. The Guppy MMA is a combination of moving averages and is optimized to allow for smoother and more accurate moving averages that are not easily spiked by sudden market movements. The biggest fallacy of basic moving average crossover systems is that they can and will be very choppy when markets are not trending. At the same time when using basic crossovers systems the traders have little or no idea of underlying trend. Is the trend continuing or is it about to end. The Guppy MMA will answer all this questions and will give you the reason why you entered the trade so you can improve on your trading skills. The importance of this indicator can not be emphasized enough! You must agree with what it is that it is telling you. The original guppy method was created by Darryl Guppy and is called the guppy. The original consists of 3,5,8,10,12 and 15 EMA for the short term moving averages (traders) and 30,35,40,45,50 and 60 EMA long term moving averages (investors). The time frame is not important with this indicator, in the Trend Follower system we use it in 5 minute markets, but it can be used anywhere from 1m to monthly charts. It is just as accurate in any time frame. In our modified guppy we use 5 different colors for each different type of trader. When you are trading it is important that you know the underlying trend, hence you have to know what other traders are doing. Using the colors you are able to tell what other market participants are up to and as such make better trading decisions. The MMA reveals the relationship between short term traders and investors. Traders (yellow and orange) probe for weakness in the underlying trend and always lead the next trend or current trends. As they are going for quick profits, they are in and out of the market very quickly. Investors on the other hand are slow to move. However for a trend to succeed, the support of investors (red and green) is essential. As a trend trader, you will be looking for situations where all the traders agree on the direction of the market (Yellow, Orange, Blue, Green & Red moving averages). If all the traders are in agreement, then that is the direction to trade. Any disagreement means you do not trade. By correct interpretation of the MMA, you will be able to identify the trend, possible trend exhaustion and also possible trend changes. Overall, you will be able to make better trading decisions. False breakouts can be more easily identified with the Guppy MMA. This also is one of many benefits of this indicator. False breakouts can be financially and emotionally draining to a trader. If the yellow or orange color lines cross the reds but the green lines still remain in their previous direction, then we are most likely facing a false breakout. For a trend change all lines especially the greens must change positions with the reds. You should especially be careful with volatile pairs such as GBP/USD. That’s it, I hope you enjoyed the reading and that it was presented with words easy to understand. May this method help you to be more profitable and better trader. As the author of this system I reserve all rights for it. You may NOT share any information given here, outside this website. If you want to share this system with a friend you can direct them to this web page where they will find all the necessary information. If you have any questions, please post them in the comments or email me. Before you do that, please look at the Trend Follower FAQ. If by any chance the download link is dead email me for re-upload and/or look down in comments if somebody mirrored the link into another host. If you want to let know others about it, feel free to link to me. If you want to link to my post please use this following code to direct your reader on the start page of the article, rather than the website itself. For suggestions, questions, comments go to our official trend follower thread at forex factory. There you can find more live examples, screenshots and more answered questions from me and then later also from a few traders who have come to master this system. Join us there! SPONSORED MESSAGE: Do you prefer auto trading? Fapturbo Is The Only Automated Forex Income Solution That Doubles Real Monetary Deposits In Under 30 Days. No Backtest Tricks. The Best Converting And Best Performing Forex Product On The Planet, Period. No Wonder It Sells Like Candy. Find out more about it by clicking here. Indicators and template are for MT4, Meta trader. Wonderful system. Thank you very much for sharing. how to define the signal alert in one bar? would u explain me more clearly about entry rules? Hi, for some reason blogger images were not working, I have now uploaded them elsewhere. Have you had problems understanding the rules because you did not see the images? Do you understand it now? I keep getting invalid session errors? Could you please email the file to me at fxfatcat@gmail.com. I continuously get “session error” messages and am unable to get the file? would you you able to post more examples of your trades using this method? and your opinion as well. I’ve sent you the file to fxfatcat[at]gmail.com. It would be great, if someone can mirror and re-upload the file to another service, where the file could be downloaded instantly for those who can’t use rapidshare. I can’t remember such a website right now. I didn’t add any password on the files. You can open them and add to the proper directory normally. 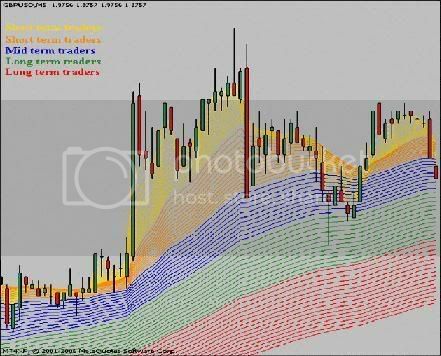 There is an official discussion about trend follower on forexfactory. Screens may be posted there! Hi, nice system. almost similar with the system that i am useing now. can u tell us the variable for MMA for all colour pls?? coz i don’t have meta4. I use another streaming. Thank’s. Here you go. I don’t know how well it will perform on other streamings . All EMA’s are based on Price Close. No telling a lie when I say I have seen about 100 different system in the past years and this1 seems to be one of the best in long time.Many systems are based on many indicators that doesn’t work together unlike this1. Applaud for being so kind and share this with the rest of the blog readers ! I have a really good Idea in trading . is there any programmer can help me to make an EA (without any fee) according. how did you get the idea for your system ? please share the process. How I got the Idea? When I started out, most of the system made no sense. It seemed as if the indicators were just randomly picked up and pasted on the chart. I knew I had to design my own then. I was trying to design a high probability system, with great timing and a good ratio between risk and profit. Wait for the perfect wave and then dive in. The search for the indicators began and those we use here line up together and every indicator does its job. That’s pretty much the biography of Trend Follower. on your template, the volatility Channel are 34 ema high/low, here on this website it says 34 ema open/close, which is it ? I have back text for a number of months back and it seems to work pretty well. 1. Do You have the the “numbers” for this system? percentage of success and failures of this system for, let’s say, 3-4 years back ? How many orders does it usually open per day, week, month, year ? How many pips does it make on average, StdDev and stuff like that ? 2. Do You happen to have the system as an ExpertAdvisor for MT4 ? This could save me some time on trying to move all the code from indicators into EA for backtesting. I have been unsuccessful at downloading the indicators and templates. Could you send them to pdean123@embarqmail.com? Thanks! Could you please email me the indicators and templates as I cannot get them to download. Look like a great system! One question…somtimes all the criteria line up but the slope indicator is opposite (eg. all criteria are met for a long trade..but the slope indicator is RED)…is it still safe to enter this trade?? Please respond…Thanks!! this trading system seem good, but for us newbies how do you install this on your metetrader and getting started. Put the indicators in this folder (assuming your default C: installation); You must offcourse unzip them. Put the template in this folder; Unzip this too. RESPONSE: This question is answered in the official forexfactory trend follower discussion, go there for the direct answer. Hi, the system looks good! but i could not find the significance of the thick blue red etc.. lines, please explane. thanks for sharing the system! after a signal if nothing happens how long do you wait before exiting? on a 5 min. chart would it be a good idea to exit after a quick 25 pip profit or in your experience it is worth waiting and taking risks of losing? is gbp/jpy not a good pair for this method? It’s good to leave at a 25 pip profit, because you are risking only 15 pips – 20 pips (stoploss). Gbp/jpy is good for this system also (sometimes too choopy, so you have to raise your stoploss and profit target accordingly), but I have not included it because it has a bigger spread than the rest of the pairs. RESPONSE: The thick blue red is the slope direction line. You can read about it in the manual and more detailed in the FAQ. So I see you work in the Forex world as well… I work with FxRebates and am looking to get in touch with people such as yourself working in the Forex market. We offer trader’s a rebate of $4.11 on every round turn lot traded and work with most of the major FCM’s. There is no minimum account value or trading volume to join or remain in the program. It’s that simple & checks are sent every month. We’re looking to work with people that will help us bring FxRebates to the traders. If you’re interested, let me know and we’ll work something out. Good commissions and monthly residuals while providing a great service that benefits your traders! This is my 4th month in forex and i’m beginning to form an understanding on concepts such as SnR, trendlines, o/b and o/s and then i came across this system which contained all the said concepts. I’m so happy, will learn this by heart and hopefully will be profitable in doing so. ;). Thank you for sharing this sytem. Awesome set up.I’ve learned more from your manual then I have in the last three months from any other source. I use it with Vantage Point software, and I find this gets me in the right direction with more confidence. I made some good trades tonight using this. the only change I made was the arrows. the red arrow blended with the red lines at times. I made it white. It helped. thank you again for sharing an awesome chart setup. Thanks for posting your system. It looks excellent from first impressions. There is one thing about the MACD signal that I hope you could clear up since I’m not really used to the MT4 platform. The MACD indicator on MetaTrader 4 lacks the ‘histogram’ that is commonly used in the MACD. 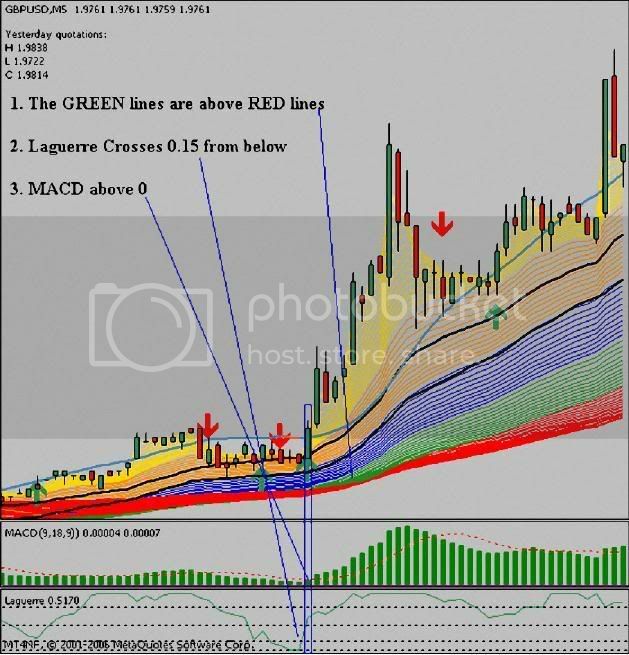 The green line (as used in this template) is actually the MACD line and the red line is the signal line. The histogram, as is shown on most other platforms, is shown as a seperate indicator called Moving Average of Oscillator. Am I just interpreting this wrong? or is the only thing we are looking for that the true MACD line (in this case, the difference between 5EMA and 35EMA), be +0 for long and -0 for short? Thanks for the trading systems. Look good. Now I am testing out. Have loaded all template and indicators to MT4. All showing except the Slope direction line. Check the indicator and it is there but did not appear in the chart. Have anyone encounter this? How to solve it? Thanks alot. 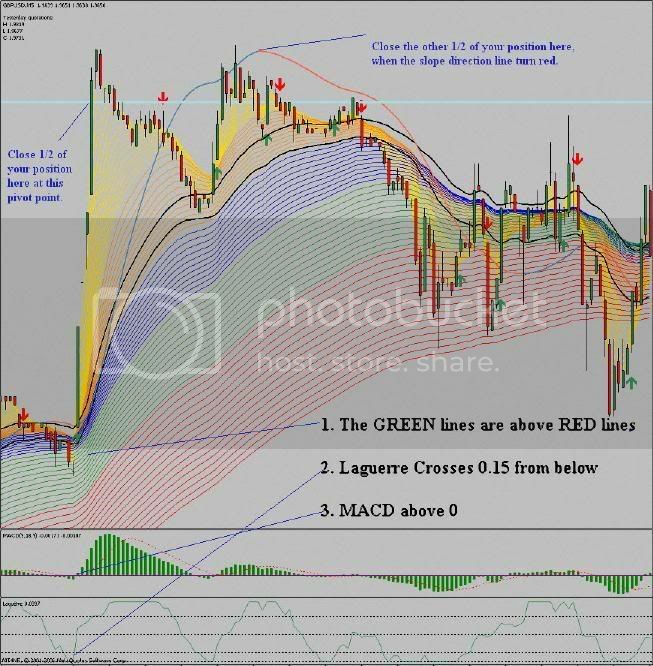 if green line is below the red line..Green , red and yellow lines are agree and head down..MACD is belew 0, but laguerre line is below 0.15…can I short? Im happy that you share this system with us! I had download your trading system and practicing it for 2 months using demo acc. Very profitable! Now i will go for real acc trading using your trading system. Thanks again for your sharing. Thank you and I never met someone very generous like u. U r my hero. Hi, I too thank you very much for this perfect system, and I was wandering if you could explain for what are those w_r1 line, m_p line…? Hey – looks excellent! I’d be keen to see a backtest equity curve also if you have some? Is there an alternative for ‘Laguerre’? Thanks to all for their comments. About the requests to send the files. Sorry I can’t send indicators everyday to individuals, we have 2 mirrors from where you can download ALL. The w_r1 line, m_p line, etc.. lines are resistance points, or pivots. Laguerre is an important factors of this system, in fact ALL are. there is no alternative to it. I’ve just spent quite some time reading up on your system and really see the merits. 1) You speak of the Laguerre crossing down under .75 or above .15 which seems odd as that is .25 spacing at the top and only .15 at the bottom. Do you mean .85 and .15 by any chance (or .75 and .25) as the crossover points? 2) For the MACD to be above or below 0, are you referring to the MACD line, MACD indicator, or the MACD histogram being above/below 0? 1) not everything needs to be mathematically correct. The rules are cross of 0.75 for short and cross of 0.15 for long. Thanks for the clarification Johnson. Are you able to explain why a short would be different to a long – this seems bizzare to me??? Afterall, we’re trading FX here not shares, so a short for currency is of course a long for the opposing currency … so why wouldn’t both long and short trades be treated the same with regard to the Laguerre confirmation? I’m pretty mathematical and I’d like to sort this in my head … how can it be that for a short we need to wait til a .25 retraction from overbought, but for a long we only need to wait for a .15 retraction from oversold. This is particularly strange to me when trading a currency pair? Any further info on how/why its not the smae figure for both would be appreciated. Thanks for the document Johnson. Upon reading it I see the default recommendation is using the line cross at 20 and 80 (ie. 20% from 0 and 20% and 20% from 100 … both long and short use a 20 line cross). I understand your system has optimised these figures but cannot understand why your long and short triggers are different (ie. 15 and 25 from the max and min lines)? This is not a criticism, but more to enure I understand the theory and of course wanting to double check you had not overlooked something and did you meant the long and short trigger lines to be same distance from the max and min. (ie. both 15, both 20, or both 25 … to cater for all markets)? Of course I understand it is not a criticism. You want to know what it is that you are doing. I’ve found out the recommendation to use these settings from another trader whose name I can’t remember. He found out during testing through many currencies that when the trend goes up its more probable is going to continue than when going down. You’ll see if the laguerre line is fluctuating up in the northern area it will many times go down to 80 and then bounce again to 100 an down again… but you can try the 80/20 settings, you will see that it is not much different, but you may take one or two signals to much. Thanks Johnson for the extra info. I suspect that the person that did this testing, and looking at long term recent data … and is seeing the current very long term trend of currencies in an uptrend against the USD, which supports your comments. However, this up trend cannot continue forever and should it turn to form a long term down trend then I suspect your bias on the indicator may reverse … ie. .85 to go short and .25 to go long. Neither of these explanations however support the fact that some of the currency pairs are already reversed in their format such as the USD/JPY, USD/CAD, USD/CHF. Perhaps this might explain why the USD/CAD does not work so well on this system (so the forums say)? However, the difference between the settings 80/20 and 75/15 is minimal so if it really bothers you, you may change it to the more mathematically correct setting – because once it crosses the 0.2 from above or below it will usually continue. Thank you VERY MUCH for sharing your great technique! I am sure you have helped many people to avoid costly mistakes. You mentioned that you tried your strategy with gold. Would it work with other commodities too? Many thanks! Yes, gold works good with this strategy. This strategy could work on almost every market, but I can’t make an exact recommendation… you should demo trade it on some commodities you trade and see if it works. If not, just use the recommended markets! thanks for sharing your system. my trading system is ‘trend follower’ and its profitable. Please could you please e-mail the experts to me at realwillz@yahoo.com. I could not get them to download. Please i will really appreciate it a lot. Great system!! question-How do you you use the volatility channel? I use it to measure volatility. If the bars(candlesticks) are inside the bands it means that the movement is constant, but the bar breaks out of the channel it either means there will be a breakout or the market is volatile. I also use it for exits like explained in the manual above. This pisses me off so much… thanks for letting me know – will take care of it. Thanks a lot for sharing the wonderful system. but I could not download the indicators. Would you please e-mail the experts to me at heheundhaha@hotmail.de. thanks again. Sent, look in your spam box if its not in your inbox. yes,i have recieved them. Vielen Dank! how do we take the trade at the signal bar? signal bar is one with arrow, right? as i know, the signal bar occur when it closed..
or do you mean the “signal bar” is one next to the arrow?? one more think, what do you mean about “recent low/high” for SL? do you mean low/high of previous bar? or what? Well naturally we can’t take the trade at the bar with the arrow. Our signal bar is right after the bar when the arrow appeared. recent low/high is the current spike that appeared anywhere from about 1-30 bars in the past. Wow….this is the best Signal Alert with explanation. thanks for your effort for sharing. How do I get my colours to match with the one on your screen shot. Also how do I download a volatility chanel. Just apply the provided template to the chart and you will have the colors and the volatility channel. I’ve spoken with the owner and he linked to my website where the information is given free. He doesn’t sell my system, so its okay. Thank you very much for your wonderful system and sharing with us. May God Bless You Always. First of all, I’d like to thank Johns0n for what looks like a great system ! .7/950 are the standard settings. Thanks in advance for looking into this ! 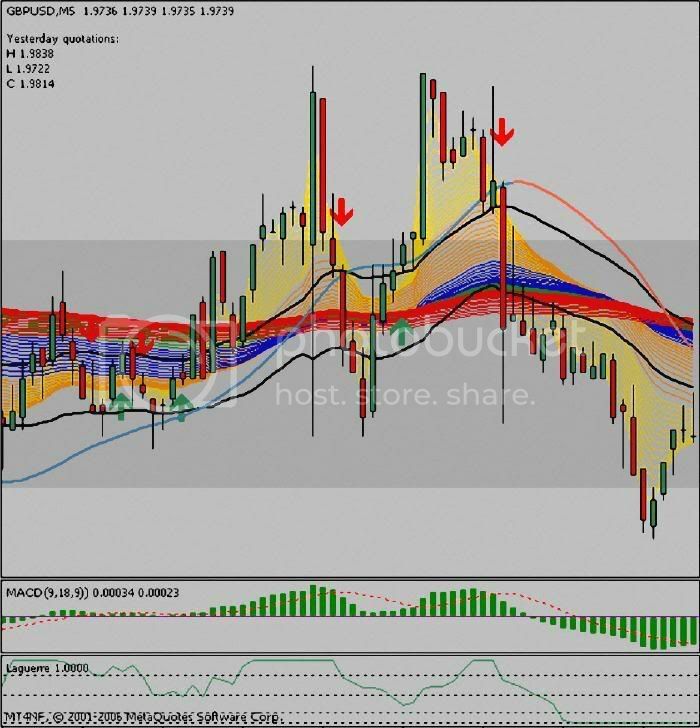 Just download the template and indicators HERE FROM THIS ORIGINAL BLOG and you will have the laguerre indicator, with correct settings. There are many modifications spread around the internet about this system or the indicator itself. You can avoid this easily by downloading it here. What matters are the gamma settings. Those are set to 0.66! I have actually checked the laguerre.mq4 file of the original files, as one can download from this blog. It states thet Gamma = 0.7 and Countbars = 950. In your recent replies, you state that it should be 0.66. What is the correct value? We have several people waiting anxiously for the answer..
Have been unable to post to the Forexfactory thread, so thought I would try here. added the EA by pmurfin, this EA proved valuable when trading a 30 min time frame in allowing me to leave my computer and receive the alerts by cell phone. However since the slope line is included in the EA as a condition for taking a trade I decided not to use the EA any more as the slope line is not a condition for taking a trade in the original system. I am now following the system as it was originally intended without considering other factors that I have gained through my experience in trading. time frame it does not consider what has already taken place, meaning that a 5min time frame does not show the same large move down that a 30min time frame would. Yesterday (Wednesday) a few hours after the European session opened while looking at EURJPY, USDJPY, AUDJPY on a 5min time frame, I had a valid short trade on all three pairs, the price on all three had been floating around the support 2 line, EURJPY and USDJPY had nothing to stop them moving to the support 3 line, while the AUDJPY had a weekly pivot line half way between support 2 and support 3, a take profit had been placed at support 3 on all trades. All trades moved into profit and continued to gain until the AUDJPY reached the weekly pivot point, after a little bounce it retested the weekly pivot and then moved up to trigger my stop, the USDJPY and EURJPY both followed a similar pattern after a little hesitation and then also took out my stop. system does not consider looking at larger times frames to get a bigger picture of what the market is doing in the long term, and a 5min time frame may not show large moves that have already taken place. I would be interested in your views and also would like to know at what point does the pivot points and support and resistance lines reset for the next trading day, when working in a different time zone to the USA. That’s why we need to look at the direction of the trend on the 30 or 60 minute chart. We time trades there and see if the trend is going in the same direction. Nothing more is needed to do on these charts, but you should look at the direction of the trend in one of these time frames. I mentioned that somewhere on the forexfactory forum, or in the faq. To find out where the trend is going in the 30/60 minute chart you may draw simple trendlines. I agree the longer times should be checked to establish what the long term trend is, which had been part of my strategy before, though when reading your faq I could not find this. Could you advice how the Pivot and support and resistance lines would be affected when using this system where the time zone is GMT +9? iam asking about the timeframe u use ? are u using the 5 min and 15 , 30 min tf in trading this system ? and what do u recommended timeframe ? do you have a general formula ? I cant grasp this mq4 language, want to translate it in ProRealTime easy language. Will repost if done so. Could you reply on the preferred period please? Hi, I don’t have the means to look at the formula right now and I don’t know it from the back of my head. Why don’t you download metatrader and see at the formula yourself? hi, i want to try this system for doing some backtesting but i’m having problems with laguerre indicator. i know you can install them directly by downloading them but i don’t use MT4 for my trading. can anybody tell me its formula or where can i find how is it calculated? thanks.. ! I suggest that you download Metatrader and use it to monitor signals and time trades. Then you use your second platform to execute the trades. I have tried this system few weeks and found that even in 5 min timeframe I should wait long time, especially waiting the color to change, other thing is I have to wait Slop direction line to cross EMA34 High & Low to get better setup. But overall this system is good for me. Do you face the same thing like me? thank you so much for your system. you will be rewarded (spiritually speaking) for your generosity. I read all the thread on forex factory. I will try it with small trades (in term of money) for a month. Thanks for sharing its great! The Wicker. I love this system because it gives a simple and clear signal to enter a trade. I am following thread on FXFactory from the beginning. Problem is that my demo account is not growing much. I know that problem is in my trading decision. I want to say that this system produces at least 10 good signals per day, but I have a problem to select which signals NOT to take into consideration. I would be happy if I enter a trade once or twice a week but I do not know to choose “right” signal. Can you help with suggestion please?? Pilatus, slowly read the posts in the forum, we have covered which are the perfect signals. It’s not that easy to spot them as you are just starting. Practice and practice and through time seeing perfect signals will be like second nature to you. I just visited your blog on unplanned. I’m from indonesia, so sorry for my english written. I’ve just downloaded your system and would like to try it in LiteForex. 2 months ago i’ve lost some money cause lack of experience, and i would like to recover it, may your system reduce my faults and be a guidance for me before deciding open trade. thanks for your free system. and the price does not move much before the signal and the signal with direction of 1 hour frame trend ,,, ??? Yes, the best signal would be when the guppy is relatively contracted and there is not a lot of movement happening (not volatile). You also need to check higher time frames to see what is happening. Ex. if you are trading the 5min check the 60 minute chart to see if your current 5minute signal is not going against a major trend in the 60 minute chart. Men, i really admire ur prfeesionalism and applaud ur archivement. I’m having problem downloading d system on MT4, pls describe the procedure for attaching it to my MT4. Your question is already answered in the trend follower FAQ. Thank u for taking the time. Maybe I am not seeing it, but where can we download the indicator package from. Thank you. I have not been able to find the link for the template download. The link above the comment section at the bottom of the page takes u back to the manual. I would appreciate it if u can please post the comment. Thank u.
have someone, some live pips with this? I must hand it to you, you are a living legend! Thank you for sharing your system with the rest of us. Just a question, how did you come up with the idea of integrating the different indicators in this system? Thanks for sharing this. I’ve downloaded your indicators, but i get different colours to the charts above. Bit confused on the rules now. You have to apply the template to the chart, otherwise you won’t see proper colors and some indicators as well. Doesn’t match the charts further up. Am just going through the set up and cannot add the volatility lines in MT4 as the MAs do not give the option of using the EMA high or low (unless I’m missing something obvious). Does anyone have any ideas? I’ll post more comments, if that’s what people do here, to let you know how the trading goes-demo account only at the moment. Ted, if you apply the template provided in the zip package everything will be setup automatically, just the way its supposed to be. Could you please email the file to me at valuuttakauppa.lahtinen@gmail.com,I continuously get “session error” messages and am unable to get the file? Could you tell me what the dashed support & resistance lines are ? It seems it is very good. Do you recommend it to be used on higher time frames? . Also, Could anybody help developing an EA (expert adviser) for this strategy ??? Hi, I have spent the past 4 days reading the post in the forum, and I realized that the rules of the system are still the same after so many people have tried to improve it. Even the EA is not as good as your trading system manually, as you correctly predicted in your first page. It really amazes me to see so many people still asking for an automatic EA, or lazy enough to not read the posts and understand the system. I haven`t tried it yet, I understand it requires time in front of the computer, and that was the main reason you gave it for free. But looking at some people results, and comments, after over 2000 posts, I didn`t find 1 single person saying the system doesn`t work. And that`s after a year. It really amazed me. After trading for 2 years myself, mainly the news, now I see a strong system to trade in between the announcements. Well, I just wanted to say thank you. If you judge a system by two failed trades then you will never make it as a forex trader. Very interresting system, but I have a problem. My trading system / broker have not included the Laguerre indicator yet. Would a normal smoothed RSI do the trick also ? any test on this ? No, that is not the same. I would advise you to get two trading platforms. One that supports metatrader and all the indicators, and the other is your broker where you will execute your trades. I have downloaded the Trendfollower-indicators and template which I have copied into the folders as mentioned on your blog. In the MT4 platform, I drag and drop the indicators under the expert adivsor to my chart but I am unable to see them working. Have I miss out those files with extension “ex4” which are necessary for those indicators to work in MT4? I only have files with the extension “Mq4”. I would appreciate if you can email to satori333@gmail.com on the full and updated trend-follower indicators. Hello you said we should unzip it after downloading it pls how do we unzip it.Pls I have been on it for 2 days now.After downloading installing it into meta4 Alpari trader platform has been a great task.Please help with the steps. First of all i want to say “Thank You” or sharing this strategy with us. 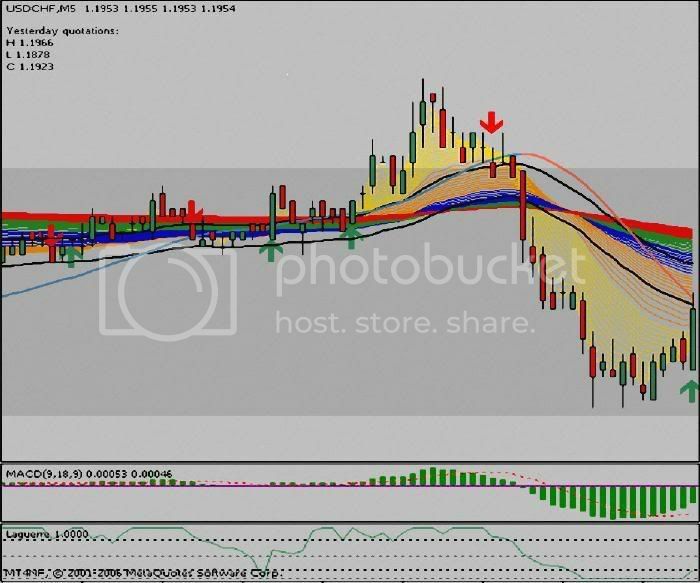 I backtested your strategy on EURUSD M5, if you can analize true,and open a position,you can earn money. But I think there’s a problem with the strategy, it is about Take Profit Point. To sum up, Signals are very useful when you analize good and you can earn money but i don’t know where i close the position? Any idea about it? What’s your advice about it expect the methods which you wrote in MANUAL. 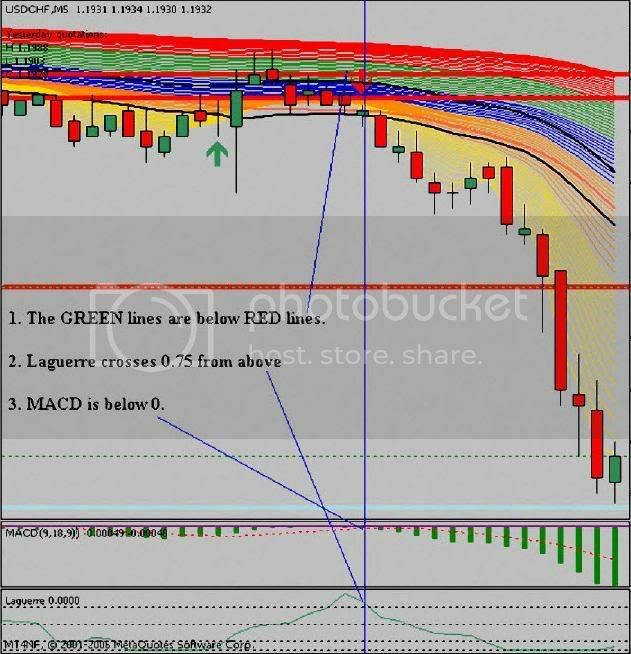 Go to our trend follower thread at forex factory and read it all. You’ll have a few days of reading and you’ll in time get a proper feeling which trades are the best, where you can expect a larger move. I have also for this sake given multiple exit points, which are described above. Ok i am reading all posts and i am on the page 75 now. I want to do everything manuelly not with EA. i want to ask u that is the original slope direction period is 80?this gives very bad signals for exit position, but i tried period 20 it is very good on backtests. ?? I’m a bit curious 😉 as part of human nature heh. I read that you don’t use this system anymore because it bored you sitting and trading in the long run. I’m a bit curious on what kind of system you are using today or you stopped totally ?. You can mail me for the answer. Whenever I trade, I trade with this system. But as mentioned over a year ago here and on the forex factory forum, I trade only rarely. But a few people on the forexfactory forum are already GREAT with trading this system, so I would definitely advise anyone to visit the forum and look at some of their live trades that they occasionally post. I am impressed with your willingness to share your expertise for free. Thank you.